I'm not sure what kind of group is the primary audience for the games like this. It is not the first game in the series. So if you have played the earlier games, you should know what to expect this time. 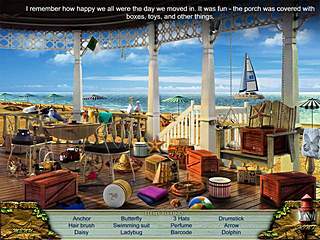 Love Story: The Beach Cottage is an adventure game wrapped into a story of an old woman. This psychological drama's gameplay is pretty typical in its basic features. This time around the game introduces you to a woman who is responsible for fulfilling her father's last will. The events are happening around an old beach cottage of the family. Something bad happened there many years ago, but now she should go back there to finish some business. Everything in that place reminds her of the past and her first love story. Going back there is almost like to live it all through again. But this might not seem such a bad idea afterwards because it will give her a chance to finally let go the events of the past. This psychological drama's gameplay is pretty typical in its basic features. You will spend most of the time here wandering around the place and collecting different clues of the game's story. You will have to do work with a lot of inventory. 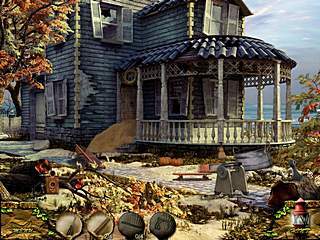 A very small number of the hidden object levels is compesated by the interactive activity. You will have to look for many items to proceed. So it does look a bit like one big hidden object level. There are some puzzles scattered randomly around the journey. The graphics are beautiful with many details, but one thing that I always appreciate is the voice-over. Well there isn't any in this game. You just read all the lines. The game is filled with the amosphere characteristic to women, so I'm not sure if the male audience really enjoy the game. If you enjoyed the first game, you will most probably enjoy this one. If you are new to these game, you better try the free version first. This is Love Story: The Beach Cottage review. Download this game here.